In this latest Tribal Class Destroyer article Dr Alex Clarke gives us the story of HMS Eskimo. Many ships loose a bow in their career, especially smaller warships which are involved in the melee; few loose it three times in a career – even in World War II. Such colour certainly serves to make history interesting, although it is not, or rather not just, because of facts like this that led to her selection for this series. HMS Eskimo’s story is so wide an complex that it could not be limited to one part, and when combined with the life of Admiral John Eaton, then it expanded even more and has therefore made itself hopefully the perfect Christmas/New Year series within a series to read. It was the events though before this rather unique and unintended version of shooting the messenger went on which had made PQ15 ‘straightforward’ passage possible; events which illustrate how important Narvik had been. These events had happened to QP11, the return convoy which had left Russia a little before PQ15 left for Russia. 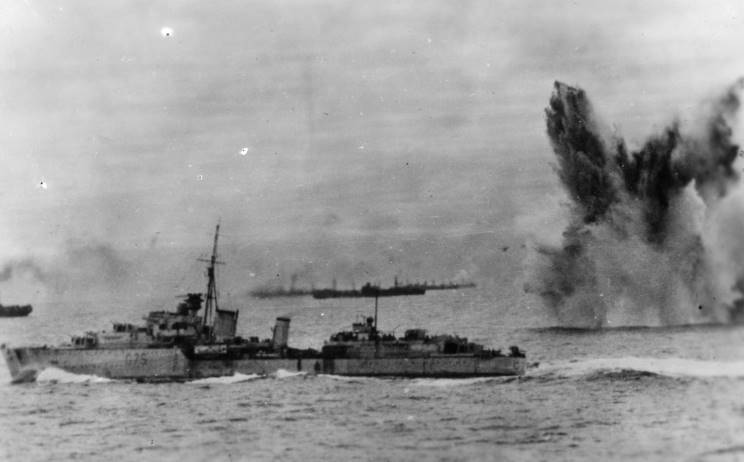 This convoy had faced significant surface attacks, attacks which caused the loss of the Town class cruiser, HMS Edinburgh (HMS Belfast’s batch sister). [iii] Although the final blow was actually given by a British destroyer so that the enemy couldn’t board her… the Germans had failed to do this, because they’d mistaken minesweepers for destroyer, categorising them in order of threat Tribal, Jervis, F or H classes and one American. [iv] These Germans had felt comfortable attacking a cruiser, but a Tribal class destroyer, with friends, was a justifiable reason for withdrawing. As for PQ15 straightforward did not mean safe, there were still air attacks which sank three merchant ships and submarines to contend with, but it was the weather and ‘friendly fire’ which accounted for the loss suffered by the escorts. [v] HMS Eskimo & Somali’s sister ship, HMS Punjabi collided with the battleship HMS King George V and was sunk. [vi] From then on though the operations of Somali under Eaton’s command only got harder, including the legendary for all the wrong reasons PQ17 and Operation Pedestal in the Mediterranean; her crew, her captain, her flotilla would get through it all in style. It was hardly much longer than Eaton was back at sea, in command of another flotilla and another Tribal destroyer, Eskimo. [x] During his time with Eskimo, as was said in Part II, he played an important role in Operation Husky – an operation covered in more detail in Tartar’s story. [xi] Operation Torch, the invasion of North Africa is well known, and besides Operation Retribution is far more revealing of Eaton and of the style of officer the RN encouraged in its destroyers in the 1930s, a style which reached its zenith in the Tribals. Militarily, Operation Retribution was a flop, the enemy didn’t show up – to use a modern analogy it was the taking of Casterly Rock in Game of Thrones. [xii] All normal rules of war said that the Axis forces must seek to evacuate their remaining troops from Tunisia. That when the light forces prevented the merchant ships from getting through, the Italian Battle Fleet must sally forth to attempt to blast a passage. After all this is what Britain had done at Dunkirk, had done for their forces deployed to Norway and Crete; to the British mind not going to retrieve those soldiers was an anathema. Perhaps it was the difference between a dictatorship and a democracy, total war as was fought in the world wars requires total commitment, but perhaps in a democracy troops could not be so easily sacrificed, as the support of the electorate matters that much more directly. Whatever the case, the big battle didn’t happen, but the operation did. Eaton’s diarised remarks above illustrate some the frustration felt by the officers involved. [xiii] Even though the patrol captured several useful prisoners, including Chief of Staff of a Panzer division, it was not the battle, not the prize they yearned for. [xiv] To officers like Eaton therefore, no matter what success achieved, it was a disappointment. As an operation therefore in many ways it was a rerun of the Spanish Civil War, lots of hurry up, lots of picking up people in small boats and not much action of the sort expected. [xv] It was again therefore an issue of maintaining moral, and rather than the words of Admiral Cunningham on commanding the operation, “Sink, burn and destroy. Let nothing pass.” it was a case of patrol, engage and pick up. [xvi] While the desire might have been for more action in Operation Retribution, in the next operation Eskimo and her flotilla were involved in Eaton will have been wishing for as little as possible. Between Operation Retribution and Operation Husky, Eaton’s Flotilla was charged with a very special mission, escorting the Arethusa class light cruiser HMS Aurora or rather her special cargo. [xvii] Aurora was carrying King George VI, who had decided to visit the George Cross Island, Malta. [xviii] This was important, and whilst Admiral Cunningham had by this point (June 19th-21st) declared the Mediterranean safe – that safe was relative, and when it came to the King’s safety, nothing less than the best was going to be called for, Eaton and his flotilla were the best Cunningham had. [xix] The mission went off without a hitch, leaving Tripoli, the King spent a day touring the island, before returning to Tripoli overnight. Having disembarked the King, the force returned to Malta to take part in Operation Husky. The presence of the P.C.O. of the Watch on the Compass Platform does not relieve the Officer of the Watch in any way of his responsibilities for the safety of the ship or of his general duties as laid down in K.R. and A.I., Chapter 32. 2.- at the same time the Officer of the Watch will appreciate that the P.C.O. is an officer of greater experience and he should take advantage of his advice during such times as he may be present. 3.- The P.C.O.’s primary responsibility is with the armament and readiness of the ships for action according to the degree of readiness ordered. His is to recommend to me any changes in the latter that he thinks the situation warrants. 4.- The P.C.O. should not normally interfere with the functions of the O.O.W., but by virtue of his presence on duty on the bridge is authorised to take charge of the ship in a navigational emergency should he deem it desirable. In so doing it is to be understood that with the first order he gives for the handling of the ship he has automatically assumed the role of O.O.W. with the responsibilities so entailed. The subsequent return of the deck to the previous O.O.W is only to be effected when the danger or emergency has passed. 5.- The O.O.W. must remember, however, that the P.C.O. is not always on the Compass Platform itself. The O.O.W. therefore must not assume that in every emergency the P.C.O. will take charge. 6.- The situation is somewhat different in cases where, in the opinion of the P.C.O., the manoeuvring of the ship is required in order to develop a maximum offensive or defensive efficiency (e.g. the starting or stopping of Zig-Zags, alterations of course to avoid a torpedo, altering course to open A.A. ‘A’ arcs, etc.). On such occasions the P.C.O. is to act as the Commanding Officer for the time being until I am on the Bridge; and the O.O.W. is to conform accordingly. A summation perhaps of Eaton’s entire leadership style, ‘if you need me, call me’; it’s also another act of trust, he has faith in his officers that they won’t call him unless he’s needed – otherwise he’d never get any sleep, but they will call him when’s he’s needed. For this officer though Sheffield was to be his last ship, but not his last command. [i] Artic convoys have a simple naming system, in the first Series PQ were to Russia, QP away from Russia; in the Second it JW and RA. However, that did not mean that PQ15 was therefore the 15th convoy to Russia of the War, in fact it was the 16th, thanks to there being both a PQ7A & a PQ7B, the combining of PQ9 & PQ10 and the running of Operation Dervish.